In the wake of a terrorist attack, a group of young people in New York seek to capitalize on the hysteria in a variety of morally dubious ways. 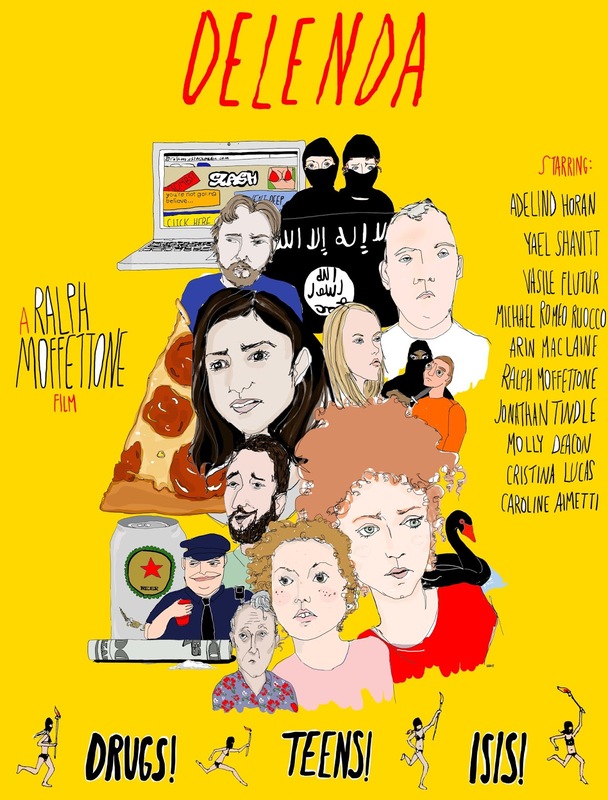 Delenda was written and directed by Ralph Moffettone, and stars Adelind Horan, Yael Shavitt, Vasile Flutur, Arin MacLaine, Michael Romeo Ruocco, and Moffettone. It will screen at the Art of Brooklyn Film Festival on Sunday, June 10th, 3PM. We had the opportunity to speak with writer/director/actor Ralph Moffettone about his film. TMS: First off, can you provide us with a little bit of background information? Did you always want to be involved in filmmaking? What type of training or schooling did you have? RM: I wanted to be a filmmaker since about middle school. Before that I liked to draw my own comic books, so I guess I always had a flair for stories. I studied film at SUNY Purchase. Every member of the crew except for one person went there, too. My peers were my greatest resource. TMS: What’s up with Delenda? Where can people see it? And what do you want them to know about the movie? RM: Delenda is a satire about a group of young people in New York — media people, journalists, artists — who seek to capitalize on a recent terrorist attack in a variety of morally dubious ways, as well as a teenager from the suburbs of Long Island who wants to join ISIS. It revolves around this exploitative Vice-like company called Slash Media, and skewers a lot of the toxic personalities and BS familiar, I think, to some of the younger residents of New York. I'm excited to show it here and share it with a younger audience. Though there is of course something in it for the whole family. People can see it Sunday, June 10th, 3PM, at St. Francis College's Founders Hall as part of the Art of Brooklyn Film Festival. After that is TBD but it will hopefully be widely available somewhere by year's end. TMS: This is definitely a unique film. Do you remember when the idea for this project first sprouted? RM: It's hard for me to remember when exactly, but I definitely had this general idea percolating for a while and these three central characters — Rosemary, Jeane, and Guy — and their dynamic, and wanted to use it to express a lot of the anger, powerlessness, and despair I felt and saw in my friends and other people in my environment at the time. TMS: What was the inspiration behind this story? Why did you want to tell this story? And why ISIS? RM: The inspiration was that anger, powerlessness, and despair. I wanted to make a film that explored a tapestry of different but related toxic relationships, and forms of abuse that ran the gamut from microaggressions to obvious horrors, and for the film to kind of indirectly suggest the ways in which the former sows the seeds of the latter. In other words, why everyone I knew seemed so dysfunctional and impotent, why we hated ourselves and couldn't resist competing with one another to accrue social capital, and how that related to the culture at large. It's a comedy. As for ISIS, I knew I wanted some absurdly bad, real-world impetus to put the characters's priorities into perspective. I call it high-concept/low-concept: the high-concept (teenagers who want to join ISIS) contextualizes, contrasts with, and emphasizes the actual substance of the film, the low-concept (the misery and limitations of the characters). ISIS came to me because a friend of mine and I used to always evoke it ironically in a really sardonic way (as in, "Yeesh, these guys are awful. Where's ISIS when you need them?") and it kind of nicely sets the film up to address the macro-fatuousness of America, via these hipsters. TMS: How long did it take to get out that initial draft? RM: I'm not sure what would count as a proper draft or when I really started to put the work in, but I compiled lots and lots of notes and wrote drafts and had a version I liked after the better part of a year. TMS: How much did the script change over the course of the next few drafts? RM: What evolved mostly was what would serve as that real-world impetus I mentioned. I knew I wanted this character Rosemary, a self-absorbed memoirist, to have the idea of breaking from her routine and writing about something "outside herself" for all the wrong reasons, but it was a little while before I settled on teenagers joining ISIS. But ISIS was the eureka moment. Once I had ISIS the writing became a lot easier. ISIS was the key. TMS: Is there anything you found more challenging when penning the screenplay? RM: It was no more challenging than any other kind of screenplay. TMS: Were there any direct cinematic influences or homages in this film? RM: I have many influences but there are no real deliberate references to other works in the film. However there is a recurring theme in which the two characters who split the narrative, Rosemary and Jeane, do things involving projectors and cameras and speak about their work in a way that is kind of a disguised reference to the film itself and filmmaking in general. TMS: Did you write any of the roles for specific actors? RM: Actually, yes — I wrote Guy for the actor Vasile Flutur and a part for myself. I had made some shorts with Vasile in college and felt I wrote the part in his register and imbued it with shades of his personality. He's really a very serious actor, someone incapable of fakery, and I appreciate that. Everyone else was found through a fairly conventional casting process, auditioning people in a cluttered, hot room in midtown Manhattan. TMS: The cast does a terrific job. Can you talk about the other actors who were ultimately selected? RM: I'm very proud of the cast. The leads, of course, are wonderful — Adelind Horan is technically virtuosic and movie-star charismatic, Yael Shavitt is the rare actor who has the confidence and sophistication to underplay everything and let the viewer come to her, and Arin MacLaine and Michael Romeo Ruocco truly make their parts their own — but I'm kind of never content to have a character serve just a functional purpose, so the margins of the film are lined with memorable turns from actors in what would usually be considered secondary or even bit parts, actors like Jonathan Tindle, Molly Deacon, and Caroline Aimetti, among others. TMS: Were you always going to play the role of Sean? RM: Yes. Sean is depraved, but depraved in a way I wanted to be pretty specific; I felt casting an actor would result in something too on-the-nose in either direction, like either a character-actor who was obviously, abjectly creepy, or a regular shiny-looking actor who would play him as like a handsome devil, twisting his whiskers. I wanted all the more minor and common ways in which he's toxic to be at the forefront, and for the film to draw a line between those and the absurdly terrible things he's revealed to be involved with later, like what I mentioned about the film in general. TMS: In terms of directing choices, anyone that you try to emulate? Or ones that have influenced you? RM: I try to prioritize originality, so I don't consciously emulate anyone, and I'm not the kind of director who name-checks other films on set all the time. Though there is one dreamlike sequence and a couple other little touches that are Guy Maddin-esque on account of how perverted and absurd they are, I think. TMS: How long of a shoot was it? TMS: Low budget film productions have been historically known for being difficult and demanding. How was this production on the cast and crew? Any challenges or funny stories? I don't know about funny stories but here's a moment I felt was strangely poignant: we were preparing for this night shoot at this rich guy's summer house in the Hamptons and I was darting around, checking in on everything, and happened upon this image, four young women — an actor from the film and several random crew members, because everyone had to wear multiple hats and lend a hand where they could — in bathing suits or shirts and shorts on the deck next to the pool sewing an enormous ISIS flag in broad daylight. Elsewhere, the production designer, Alanna Morton, was sitting in a mountain of fabric frantically shearing the shapes to be sown into the flag next. 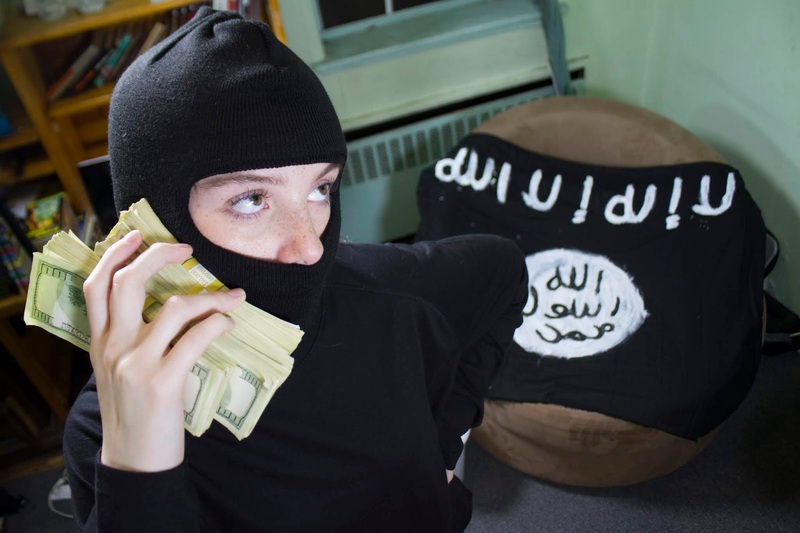 And I gazed upon this image, these college-aged people sewing an ISIS flag at this man's house and all the mayhem it portended and thought, "This is quite the unusual life I've made for myself." It was a delirious, but good, feeling. It felt right. TMS: How important was it to shoot in Brooklyn and use local cast and crew? RM: Well, I live in Brooklyn, the film is mostly set in Brooklyn, and every film person and actor I had access to was Brooklyn- or at least New York-based, so it was kind of in every sense inevitable and necessary. TMS: Is there anything you learned from working on Delenda? RM: Lots of little practical things, but also that, no matter your collaborators, you are ultimately, truly alone with your film as an independent filmmaker at the end of the day, and you have to be content with that. TMS: If the movie was playing as one-half of a double feature at a drive-in theatre what would be the perfect support feature? RM: That's an interesting question. ISIS makes videos, maybe a sampling of their greatest hits. TMS: If you had a choice to write the remake of a genre movie, what movie would you like to remake? RM: Lady and the Tramp II: Scamp's Adventure. TMS: Delenda is going to have its NYC premiere at the Art of Brooklyn Film Festival. Are there any films or filmmakers that you're looking forward to seeing or meeting there? RM: I can't say I know any of the filmmakers there, but I assume we're all indie folk and that's the beauty of it and I look forward to meeting whoever I meet. TMS: Can you tell us anything about the other projects that you are working on or planning on working on? Or, anything else that you would like to plug? RM: I have a new feature script I'm trying to make happen so if anyone has any money hit me up. Otherwise, you can follow @DelendaFilm on Facebook and @ralphmoffettone on Instagram for Delenda-related stuff. And come to the screening! I'll be there, you can harangue me in a public if you don't like it.